Tonight’s show in Naples featured the first solo-acoustic “Thunder Road” of the tour, in the closing spot, for a post-“Twist and Shout” bonus for the crowd. 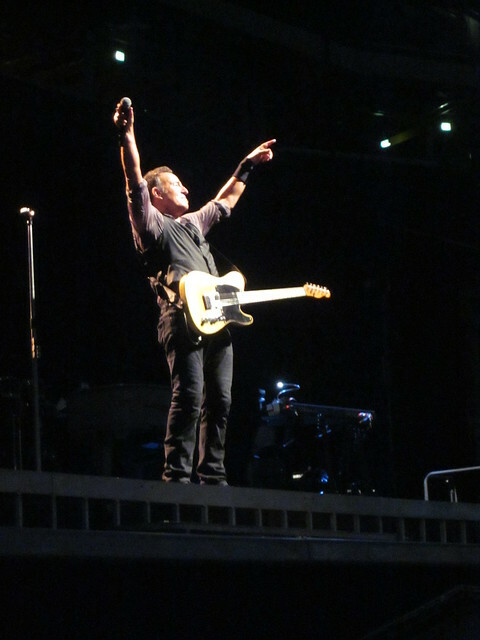 The performances of “Thunder Road” this tour have been generally excellent, and Bruce has noticeably become more free about allowing and encouraging the crowd to sing along. Tonight, at the end of the show, he quite literally relies upon the crowd to carry the song, and it was indeed an outstanding performance, from both Bruce and the audience. “Thunder Road” has occasionally been used as the closing song of shows before, including the 2002 European leg of the Rising tour. A solo-acoustic performance to end the show is a relatively new development, however, and something that Bruce has used at some of the private (fundraising benefits for his childrens’ schools) and charity (the Light of Day performances) shows that he’s done in recent years. 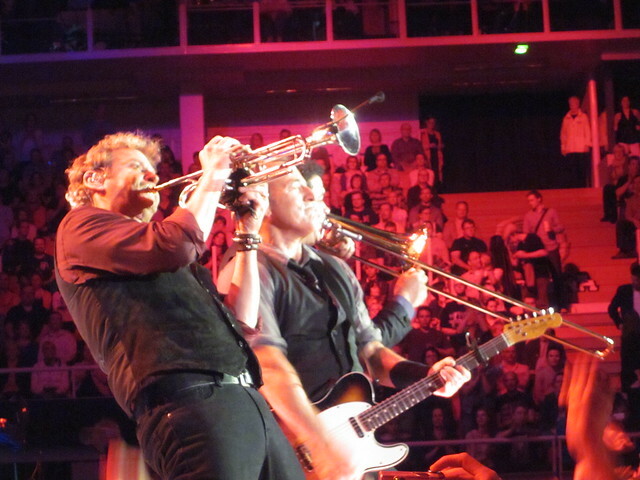 This was the first time it’s been done at an E Street Band show, however. It also appears that encouraging the crowd-singalong to “Thunder Road” at the end of the show may well have been Bruce’s tip of his hat to his last concert in Naples, on May 22, 1997, at the very end of the Ghost of Tom Joad tour. With a large crowd assembled below the theater singing “O Sole Mio,” Bruce takes a curtain call on the second-floor balcony, and then emerges with guitar, harmonica and Kevin Buell in tow, holding a mostly-unnecessary lyric sheet. The video below tells the rest of the story; notably, the only words that one can actually hear from Bruce are “The screen door slams…” before the crowd takes over. A review for Backstreets can be found here. Be sure to check out the incredible video there courtesy Dan French (thank you for your meritorious service to the fan community). Picture of the handwritten setlist can be found on Brucebase here. “Wages of Sin” was just incredible. There are times when the band pulls out an extreme rarity (or, occasionally a world premiere) and things don’t go so well. “Livin’ on the Edge of the World,” done at the second night at MetLife Stadium this past September is the obvious example. It was a great moment, but it would be fair to describe the performance as rough. But tonight? It was perfect. I hesitate to use the phrase, given its frequent overuse with respect to performances this tour, but the band did indeed nail this song. There was thought put into the arrangement, with Max using mallets to get the right drum sound. Roy again showed why he’s the most valuable member of the band, and Curt Ramm’s trumpet part was a great addition – adding an additional texture without being dominant or overbearing. And, as discussed in the Backstreets review, there was the way it was incorporated into the thematic arc of the setlist, with “The River” and the “Youngstown” – “Murder Incorporated” pairing after it. Then there is the matter of “Ain’t Good Enough For You.” After tonight, it is even more of a puzzlement that this has not been performed more on this tour. This is the most obscure of songs and the crowd was immediately into it, singing along with the melody, clapping and dancing. Yes, the lyrics are complicated, but that’s where the teleprompter comes in handy, and Bruce had lyric sheets taped to each of the three platforms that extended out from the stage. I dare not dream how much the shows could be improved if this was played each night rather than “Sunny Day;” I just hope it could perhaps occasionally replace it. It would also make a great choice for the encore. Given the amount of space devoted here to discussion of the Magic songs, I think it is indicative of what sort of show this was that it has taken four paragraphs before even beginning discussion of how the show opened, with not one but two songs from this superior album. “Long Walk Home” was superb, and it works very well at the beginning of the show, having been at the end on the Magic tour and when played on the Working on a Dream tour. “I’ll Work For Your Love” was a sweet tribute by Bruce to his fans (echoing its first use in that format, the Buffalo show in 2009). Here’s hoping that both of these songs do not remain rarities. Bruce is now using the start of “Tenth Avenue Freeze-Out” to introduce the band. It works fine, but just takes a bit too long, due to the size of the band. Bruce forgot Max tonight, a casualty of same. Nobody is perfect, and even this amazing setlist did have “American Land” as the final number. My impression is that “Rosalita” would have been a lot better in that spot. Aside from that, it’s hard to find much of anything to quibble over. Even “Lonesome Day” sounded refreshed, working much better as an “occasional” visitor to the set rather than an every-night song. Special mention is due to the crowd in Turku which presented Bruce again with an eclectic selection of signs from which to choose. There were no “easy outs,” songs that the band regularly performs or are regularly in the set. The results speak for themselves. “Blinded By the Light” was a treat, and playing it in the usual “Spirit in the Night” slot showed the sign requests working effectively. Unlike the prior night, there was no “Queen of the Supermarket” downside to the signs, either. Tonight’s show is a massively positive indicator for the balance of the European tour. No, Bruce will not be able to replicate tonight’s “Wages of Sin” moment on a nightly basis, but he certainly is able to create a show with a setlist of this quality again. I look forward to seeing him do so. Needless to say, I was very pleased that Turku did not get an “album” show (apologies to my Finnish friends who were hoping otherwise). The opening run of songs worked very well. “Two Hearts” and “No Surrender” certainly appeared to be audibles but it also could have been Bruce switching things around that were already on the setlist. Steve had a lot of fun during the start of the show, including “My Lucky Day,” which worked far better than I remember it from the Working on a Dream rehearsal shows. Conversely, the rule “live-by-the-signs, die-by-the-signs” was observed tonight with the unexpected “Queen of the Supermarket.” Yes, we all get to cross it off on our list of “songs we’ve seen Bruce do” but save that, one wonders what might have taken that spot in the set – perhaps it would’ve been another solo piano performance, as was intended for the spot that “Mountain of Love” took in Stockholm. Incredible statistic: “Queen of the Supermarket” has now been played live twice this tour, while “Gypsy Biker,” “Livin’ in the Future” and “You’ll Be Coming Down” have not been played once. One final word is due about the signs, as an observation throughout the tour, but also especially over the last few shows, which is that people really want to see “New York City Serenade,” and if the signs are any representation, it might be most desired “rare” song. Bruce will of course never spontaneously grant a request for it (it would require practice in advance) but perhaps he’ll keep that in mind if any more album shows get planned. Moving “The River” early in the set (rather than following “Sunny Day”) was a good choice, but that also results in the spot following “Sunny Day” feeling somewhat empty. If Bruce doesn’t want to drop “The Rising,” he might also consider moving it to the front half of the show and trying something else in that spot in the show. Some of the “Lucky Town” material could work there, as would “High Hopes,” a song that I had (and still have) high hopes will be performed on this leg of the tour. This was a vastly superior show to last night, and really quite good overall. Once Bruce had played Born to Run on night one, it required little imagination to suspect that Darkness would come out on night two. (I’m quite sure it’ll be Born in the U.S.A. next Saturday). The band’s performance on Darkness was excellent, and my overall impression is that it was the best version they’ve done, superior to its prior incarnations in 2009 at Giants Stadium and the Spectrum. Bruce’s guitar work was strong, particularly in “Adam Raised a Cain,” and Roy shined – as he always does – on “Racing in the Street.” One feature that took me by surprise was Bruce pushing the tempo faster during “Prove It,” adding some new life to the song. (Sadly, the “’78 intro” was absent). The opening to the show was simply fantastic. “My Love Will Not Let You Down” remains a great opening song, and to get both “Leap of Faith” and “Better Days” within the first four songs was magnificent. The current incarnation of the E Street Band is just perfect for this material. Ideally, these songs will continue in rotation and Bruce will see fit to find a few more from 1992 to pull out, including “Roll of the Dice,” “Real World” and “Lucky Town.” Adding “I’m a Rocker” (via sign request) was an inspired choice, one of those moments where the sign request is immediately granted and works well. The back half of tonight’s show also held up better than it did on Friday. “Radio Nowhere” to follow “Sunny Day” was effective at recapturing the intensity from earlier in the show, and “Seven Nights to Rock” gave Bruce the opportunity to introduce the band. Bruce essentially went clockwise around the stage, starting with Soozie, and Steve got the honors as the last person introduced. “Rosalita” would have been a much better choice than “American Land” for the final song of the night. Also notable about the encore was that Bruce brought up a young person on stage for “Dancing in the Dark” – but not to dance. Rather, they were given a guitar and played along with Bruce, trading off the “hey baby!” lyrics. I found this to be much more valid and interesting than the parade of children during “Sunny Day” (of which there were none tonight). What happens on the rest of the European tour? As mentioned above, it seems very likely that the third show in Stockholm will be Born in the U.S.A. What will happen in Turku on Tuesday and Wednesday is much less clear. The shows in Oslo immediately prior to Stockholm didn’t have full album performances. Bruce’s long introductions about his relationship with Sweden and Stockholm obviously don’t apply to Turku, a city in which he’s never played. It is certainly plausible that the album shows will only happen in certain locations – London and Milan seem obvious choices. Then again, once the album shows were announced for Giants Stadium in 2009, they continued for the balance of that tour, with “Born to Run” played at almost every show. I doubt it would be inaccurate to suggest that most fans – even those who didn’t get to see the 2009 album shows – would be disappointed if “Born to Run” was played at the vast majority of the shows on the European tour. The only multi-night stands remaining on the tour are Turku and Kilkenny (the two London shows being separate entities). 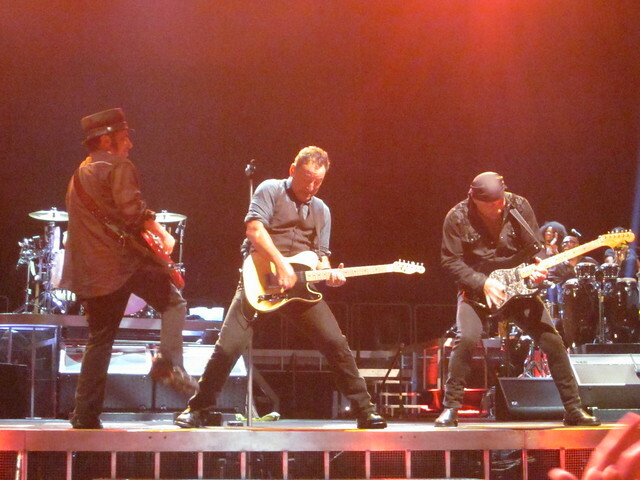 Would Bruce really play “Born to Run” at every remaining show other than the second nights in those cities? It seems impossible. Perhaps the more likely scenario is that he rotates the albums within the various countries — with the four German or four Italian shows each getting different albums. In addition to Born to Run, Darkness, and Born in the U.S.A., 2009 saw one-night-only performances of Greetings…, The Wild, The Innocent… and The River. If any of those three were to get played, I would think The Wild, The Innocent… would be the most likely. The length of The River and the challenging nature of the material on that album and on Greetings means that those albums just aren’t possible in a stadium. The hope here is that the complete-album performances stay away. As mentioned previously, I mean no disrespect to the European fans who haven’t seen these performances before. I simply think Bruce can and should do better for his fans. Playing albums in full is something that artists do when they have nothing new to say. When they have no new album to promote, and simply want to get out and tour (and make money). It’s a gimmick used to sell tickets, and Bruce generally doesn’t need that help in Europe (a few shows excepted). As evidenced by his most recent record, Bruce does have things to say, and it’s a shame that he has dropped so many of the new songs from the setlist. “Rocky Ground” remains relevant, interesting, and yes, challenging to his audience. He should be playing it every night. Bruce has spoken extensively about how “We Are Alive” was key to completing the Wrecking Ball record, which makes its absence from the show all that much more puzzling. “This Depression,” even without Tom Morello to guest, has captured the audience when played in a stadium. Album shows for The Rising, Magic and Lucky Town would be amazing. But even more than those, if Bruce is going to do shows where he plays an album in full, the one he should do is Wrecking Ball. I reviewed this show for Backstreets; report can be found there. I truly was shocked by the appearance of the entire Born to Run album. When Bruce started addressing the crowd with the harmonica in his hand, I was expecting a repeat of the piano version of “Thunder Road” that started the Hyde Park show last July. Looking back on the show, the fact that the album performance was the highlight of the show is distressing. A fair analysis of the 2009 tour indicates that Bruce had, for good reason, given up on the “Working on a Dream” album and either had run out of ideas for his live show or simply fell back on what seemed easiest — entire performances of “Born to Run,” and occasional performances of other albums. On this tour, Bruce’s new material is of significantly higher quality, yet he is giving up on much of it, with the live show now down to three or four new songs per night. He has ignored his two “new” discs of outtakes (The Promise) that are well suited to his band, in particular, a horn section and backing singers. There’s also his outstanding 2007 album, Magic, that has joined Tunnel of Love, Human Touch and Lucky Town as material that is completely ignored for the live set. So why is he resorting to a whole-album performance of Born to Run? If this was a special, one-time event, then there is no problem. But if this special feature is repeated elsewhere in Europe — or if Darkness or Born in the U.S.A. turn up tomorrow night, then that’s reason for major concern. (Note to European readers: I understand perfectly if you want the opportunity to see the album shows, and don’t begrudge your desire to to so one bit; I just think Bruce can do better than that for you). 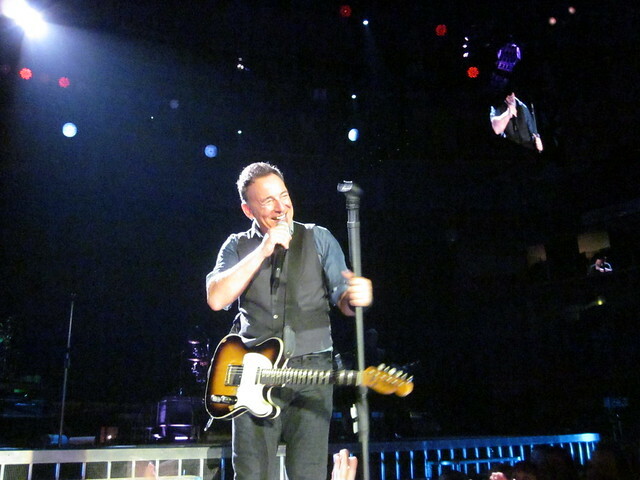 Bruce’s introduction of the album during the show was particularly heartfelt, and he did achieve his stated goal of surprising everyone. I just wish he had chosen something more challenging and innovative as the surprise. Compounding the issue was the setlist that surrounded the album performance. I have no quibble with “Out in the Street,” “The Promised Land,” and “Darlington County” coming out on night one of a multi-night stand. But some of the other choices – “Pay Me My Money Down” in particular – were baffling. Playing it in such close proximity to “Sunny Day” was a big error. I think Bruce himself knew things were going off the track when he cut “Shackled and Drawn” short. Stockholm is the fourth three-night stand of the tour (East Rutherford, Sydney, Melbourne) and the second nights in each of those cities represented a big change in the setlist. I am hopeful that pattern holds for tomorrow, and in particular, that Bruce plays some of the 1992 material he had been trying recently, as well as the “Magic” songs and “High Hopes,” which came out in Australia. Also fitting would be an increased presence of his new album. “This Depression,” “Rocky Ground” and “We Are Alive” are too good to be discarded from the show so early (particularly while “Death to My Hometown” remains). While there certainly is some overlap in fans seeing shows in 2013 as well as 2012, all of the European cities getting shows this year (excepting Milan, Paris and London) did not have shows in 2012.